Historically, some of our best decisions have come from investing in a global leading business, when many investors were obsessed with short-term concerns and the share price is depressed. Providing the underlying industry position remains favourable, the company will recover strongly when sentiment in the sector improves. Purchases of Microsoft, JP Morgan and Novo Nordisk were all made in the face of adverse short-term conditions and they have since rewarded investors handsomely. 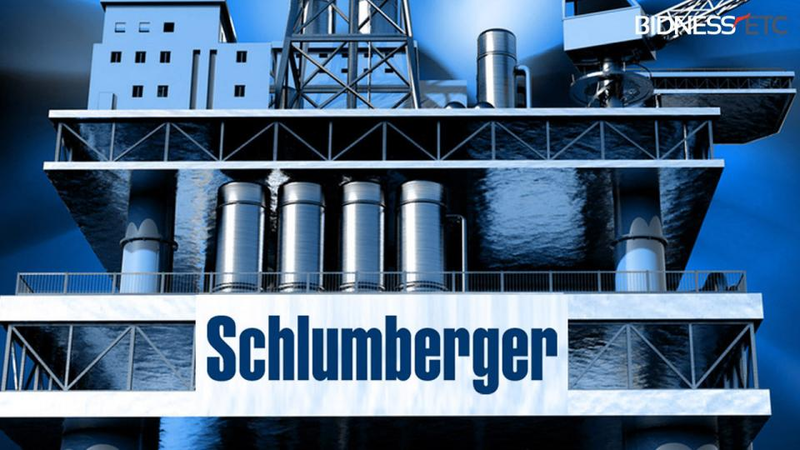 Schlumberger is the leading provider of technology services to the oil and gas exploration sector. It specialises in reservoir characterisation, drilling (bits, fluids, tools), production and processing technologies to the sector. It operates in more than 85 countries, is active on over 3,000 drilling rigs and employs over 100,000. It has always been regarded as a high quality, technological leader. SLB invests over $1bn pa in R&D* (more than the combined investments of 3 closest competitors) and has a strong position in unconventional reservoir extraction. The steep decline in capex by the oil companies is unprecedented and unsustainable. 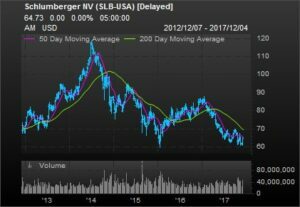 Over many years we have watched Schlumberger shares and met former management, yet the shares were never cheap enough and the yield was too low. The above chart highlights an almost 50% fall from the peak and while the short-term earnings multiples are high, we expect a rapid recovery in earnings over the next 5 years. Schlumberger depends on activity from its customers and many have been squeezed by a sharp reduction in cash flow from weak oil and gas prices. Industry statistics indicate that inventories are now broadly in balance and the oil price has recovered to over $60 Brent. Nevertheless, many in the sector intend to keep a tight lid on capex in the short-term. In response, the downturn has accelerated the consolidation of the oil service companies. It will give them greater bargaining power when the upturn arrives. It has also driven closer technological co-operation between the service/technology providers and the E&P companies. In response, SLB has shared some of the cost burden on customers by widening Production, Drilling and Service ventures. However, these contracts that have significant upside performance elements. The highest level of collaboration is in Schlumberger Production Management) SPM, where the company takes full responsibility for technology and performance. Currently SPM manages 11 projects and produces around 235.000 bpd. As ever, the biggest factor is timing. While the global economic recovery appears sustainable and demand for oil and gas is expected to be positive, companies remain cautious about increasing capex to new programmes. However, declines in production are inevitable without fresh drilling and investment can be delayed, but not avoided. Despite the collapse in activity, operating margins for the SPM’s divisions are still above 10%, highlighting the quality of the business. The dividend is not covered by earnings, but the balance sheet is robust with net debt (including pension liabilities)/EBITDA at only 1.8x) and management is committed to the pay-out. Given our low confidence in being able to time share price bottoms and tops, we have initiated with a 1.5% position in TB Saracen Global Income & Growth and will top-up into any price weakness.